The Federal Government says it “is happy” to lock in a legal requirement that power companies pass on savings arising from the abolition of the carbon tax. 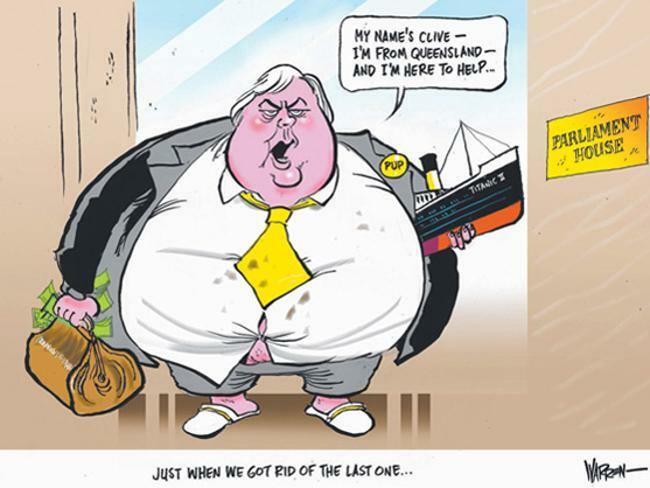 The move, which would satisfy the only condition laid down by the Palmer United Party for its crucial support to the repeal bill, follows talks between PUP leader Clive Palmer and Prime Minister Tony Abbott this morning. Environment Minister Greg Hunt has told Parliament it will add to the Government’s efforts to monitor power pricing through the Australian Competition and Consumer Commission. “The ACCC will be on the job but we are happy to take the considerations of members of this House and to go even further and to enshrine in legislation guarantees over and above what we already have, so prices will be lower than they would otherwise have been,” he said. Late yesterday Mr Palmer revealed his party’s position that it would vote with the Coalition in the Senate to repeal the carbon pricing scheme, but only if lower power prices were locked in. “I think we can work a solution out on carbon tax, we can ensure that electricity prices will come down for Australians. I think that’s a positive thing,” Mr Palmer said shortly after this morning’s meeting with Mr Abbott. Mr Abbott told Parliament in Question Time that he is “delighted” that PUP senators will vote to abolish the carbon tax and is receptive to Mr Palmer’s suggestions. “I look forward to working with him to ensure all the savings from the abolition of the carbon tax are passed on,” he said. Just before the House adjourned on Thursday, there were jubilant scenes on the floor of the House of Representatives as the Coalition passed the carbon tax repeal bills for the second time. The final vote went through on the voices after which Environment Minister Greg Hunt was embraced and high-fived by colleagues. He had earlier successfully moved an amendment to split the Clean Energy Finance Corporation abolition – which will not pass the Senate – from the package of bills. Labor unsuccessfully moved an amendment to repeal the carbon tax and move straight to an emissions trading scheme. If someone – anyone – knows where the key to the door to reality might be hiding around Parliament House, they’re not telling. As Clive Palmer, a man who plans to dig enough coal to blot out the Chinese sky, stood next to Al Gore in the Great Hall on Wednesday evening, declaring he wanted to save the world, a sort of awful knowledge crept over the assembly. This might help understand Al Gore. Since 2007, the former Vice President in Bill Clinton’s administration has been preaching the benefits of putting your money where his mouth is: Alternative energy. Not that he would say so. At least out loud…. Reading through the promotional materials he puts out through his company, Generation Investment, it is hard to tell whether his “Client Update” is selling investments in his Climate Solutions Fund or memberships in the Sierra Club…. But even Gore does not seem to be listening anymore. Gore’s company files a quarterly report with the SEC that tells a different story about the 30 stocks in its portfolio. His company’s public investments in wind, solar, biomass and other alternative energy to combat climate change are practically non-existent. When Warren Buffet dumps his wind and solar farms in the USA, the CAGW scam will be officially dead. Right now Buffet is bragging he is GOING TO double his investment. Bye the Bye if any of you are down Australia way could you please stuff Al Gore in a snow bank preferably in an avalanche zone? Wasn’t high energy costs the POINT of the tax, a market driven incentive to reduce energy use? Greens are for …. what? It’s not about the use per capita of energy from fossil fuels. It’s about gross consumption, which is a population number problem. The unthinking haven’t figured this out, and the thinking are keeping this dirty little secret vlose to their chests. 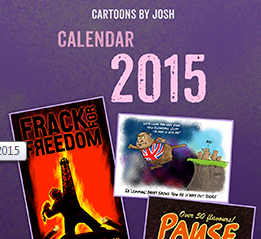 I think I just got some more information on this site than anywhere in Australian news. However, that is not my reason for making a comment. It seems that Australia has felt the Al Gore effect with regards to the weather. We have just had a week of blizzard conditions in some places (Thredbo is close to Canberra where Al Gore was staying), high winds and other chilly conditions. Once I learned that Al the Bore was in town it was like… hello…. the Al Gore effect survives!! 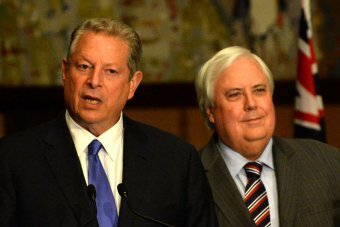 Gore was trying to get Palmer to commit to the idea of Australia moving towards an ETS. Well as it happens, the reason that Malcolm Turnbull was ousted as leader of the Liberal Party was over his support of an ETS. No way, Jose.!! David Archibald: The edge of a cold, deep abyss? Does a steep drop in solar activity imply an equally steep drop in temperatures?